A quick reference on how to send us files. If you have any questions, please call and we will be happy to help you as we know file preparation may be confusing. Jobs sent into This Creative for digital printing or offset printing should adhere to these guidelines as closely as possible. By meeting these guidelines, there is a greater opportunity to reduce the overall cost of your job by reducing the amount of time spent altering, correcting or preparing your file. Subsequently, it will move faster through our shop. Make sure the PDF is high resolution and includes crops and bleed. If you supply us with a low resolution PDF, the output results may not be what you desire. These types of files are InDesign, Illustrator, Quark, etc. When you send this type of file to us, you will need to supply all of the elements that go with that job, including items such as fonts, images, and any artwork that has been placed or used on your pages. If you are going to upload these files to us, please compress/zip all of the files into one single archive. On a Mac you can “control click” and select the “Compress” option. On a PC, you can “right click” and select the “Compress Zipped File” option. If you are supplying an image to be used in a job, please DO NOT place the image into a word document. Send us the original image as a jpg, tiff, psd or png file at the highest resolution possible. A “bleed” refers to print elements (images, backgrounds, etc.) which extend beyond the trim area of a printed piece. 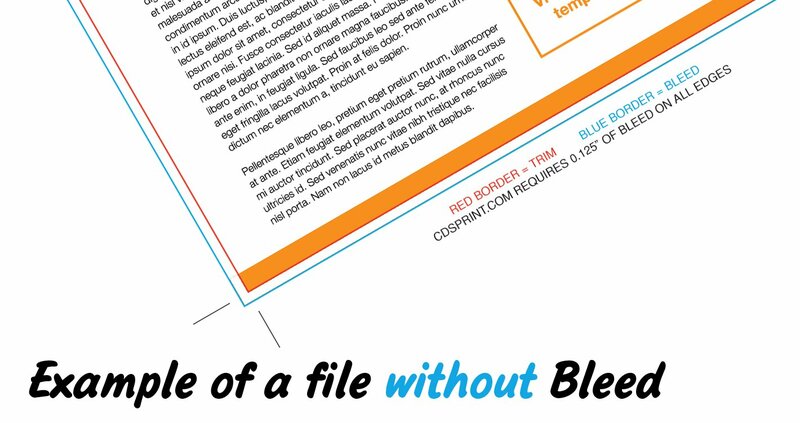 It allows a printer to trim the document to its exact size without any danger of white space showing up along the edges of the piece. Slight shifting can occur during printing as a result of paper, printing, or trimming variance. We recommend a minimum of 1/8’’ bleed on all edges of the artwork. Remember, any artwork which extends into the bleed area will be trimmed away! 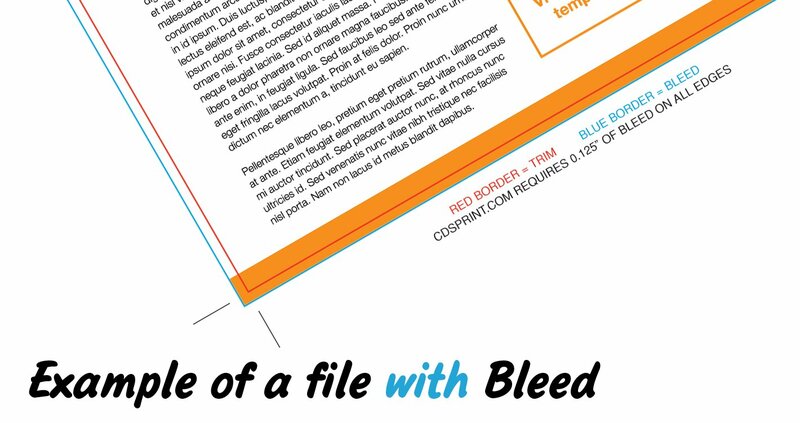 You will want to make sure no text or other critical content extends into the bleed area of your document.